On January 28, 2016, the SnomadS descend upon Traverse City, settling in at Ranch Rudolf, a real, working horse ranch nestled in along the scenic Boardman River. In the summer, they cater to amateur and experienced horseback riders, fly fishers looking for fresh trout, canoers and kayakers. In the winter, they are all about snowmobiling, with snowmobile rentals taking over the canoe rental barn. As the early arrivers great each other around the open fireplace in the historic lodge, Dave lead a small group of eager sledders for a short, impromptu ride. Many more Snomads arrived later in the afternoon and evening, and they all enjoyed dinner at the Ranch. We made arrangements with Melody, the owner, for a bonfire on Friday night as a unique way for the Snomads to socialize after the next day’s ride. After a well prepared breakfast buffet in the lodge, the group broke up into a couple riding groups. Bill Green lead one group, and Dave lead the other group, heading to Lake City for lunch. Along the way, the groups crossed the picturesque Manistique River, stopping for a couple photos. Once arriving in Lake City, Bill’s group went to the newest restaurant in town, Grillers, while Dave’s group went to BC’s Pizza for a pizza buffet. Both groups made their way back to the Ranch for dinner and getting ready for the planned bonfire. But while sitting down for dinner, someone came into the restaurant shouting “Fire!”. We ran outside to see the sled rental garage smoking, with an orange glow coming from the roof. Several people worked to drag all of the rental sleds away from the building, while others called 911. The flames grew larger, and soon large flames were shooting through the roof, with melting snow pouring down from the roof. It took the fire department about 30 minutes to arrive, during which time, the fire grew to engulf the entire building. Fortunately, the wind was blowing the flames away from the hotel rooms and lodge, but unfortunately, it was getting dangerously close to the gasoline and diesel storage tanks out back. So when the fire department finally arrived, they focused their attention to protect the fuel tanks. But due to the congestion of the sleds, trucks, and trailers around the lodge, they couldn’t get the backup water tankers in to keep the building from becoming a total loss. We woke up the next morning to see the extent of the damage. The garage was burnt right to the ground, along with several pieces of grounds equipment in the building. But the fire crews kept the fuel tanks from catching fire, preventing much greater damage. Again, the staff took excellent care of us by preparing breakfast in the morning as if nothing happened. After eating, we broke up into a couple groups again, with Dave taking a group into Fife Lake for lunch then a ride down to the banks of the beautiful Manistee River at the Old 131 Campground. 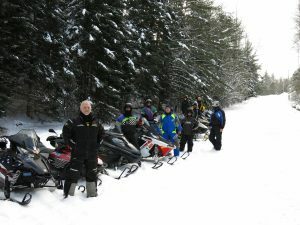 Marty lead a group on an expedition to find a “clever” route out of Kalkaska to Starvation Lake. After lunch, they took trails back around the long way back to the Ranch. We departed the Ranch on Sunday. We had great fun with friends, great trails, and memories that most of us will never forget.